Senior Academy books may be purchased from our store, from Amazon.com, and from many other sources. If you are buying other books at the same time, you may find that buying at Amazon.com can save on shipping costs. For bulk purchases for classroom use, you need to buy from our store in order to receive your discount. Enter your discount code on the shopping cart page. See Teaching Resources on how to obtain a discount code. 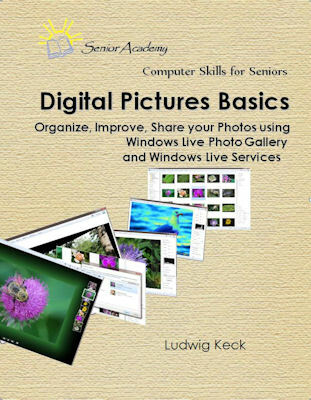 Digital Pictures Basics 2012 is for seniors getting into the world of digital pictures but with little technical background. 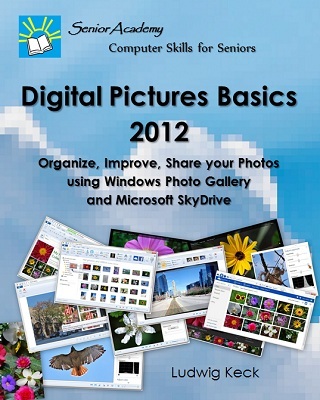 The book teaches the skills for using Windows Photo Gallery and Microsoft SkyDrive for managing and sharing pictures. This book is easy to understand and follow, and is written with the interests and learning styles of older adults in mind. Featuring large print and easy layout, the book is organized in twelve lessons for effective self-study or as a textbook for an instructor-led training course. Written in easy steps, with detailed exercises and plenty of illustrations, this manual will help you gain the skills and become comfortable in managing your pictures on your computer. This book covers what happens after you have taken the pictures. This book does not teach how to use your digital camera and how take good pictures – that is covered in another manual. Set up your computer and move your photos from your camera to the computer. Organize and file the pictures using tags to find any picture easily. Enhance your pictures to bring out their best – crop, adjust exposure, color and more. Correct red-eye, select the best parts from similar photos, transform pictures artistically. Make panoramas and collages from photos. Share your photos with family and friends by email, or with prints. Share your pictures online for family and friends to enjoy. Digital Pictures Basics is for seniors getting into the world of digital pictures but with little technical background. The book teaches the skills for using Windows Live Photo Gallery and other Windows Live Services for managing and sharing pictures. This book is easy to understand and follow, and is written with the interests and learning styles of older adults in mind. Featuring large print and easy layout, the book is organized in eight lessons for effective self-study or as a textbook for an instructor-led training course. Correct red-eye, transform pictures artistically, make a panoramic photo. Share your photos with family and friends by e-mail or with prints. NOTE: This book also describes Windows Live services that are no longer available. 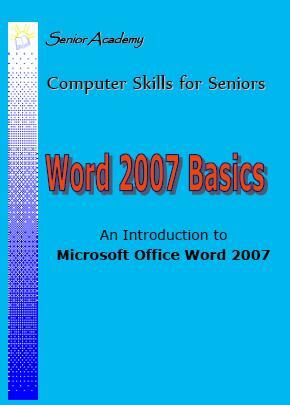 Word 2007 Basics is for the beginning user with little technical background. This book is prepared for seniors. It is easy to understand and follow, and is written with the interests and learning styles of older adults in mind. Featuring large print and easy layout, the book is organized in eight lessons for effective self-study or as a textbook for an instructor-led training course. Written in easy steps, with detailed exercises and plenty of illustrations, this manual will help you gain the skills and become comfortable using Word to prepare letters, notes, shopping lists and other simple documents. Learn the skills to use the many features to give spark and dazzle to fancy fliers, invitations, and other documents. Use the Ribbon and the many commands. Apply formatting such as fonts, sizes, colors and other features. Change the layout and appearance of text for appealing effects. Create, save, and manage files. Check spelling and grammar errors and how to let Word assist you. See beyond the basics for future skill development. Gain skills and confidence in using Word 2007. You need Microsoft Office Word 2007 installed on a Windows Vista or Windows XP computer. You also need Internet access to download practice files and use the Microsoft online resources.